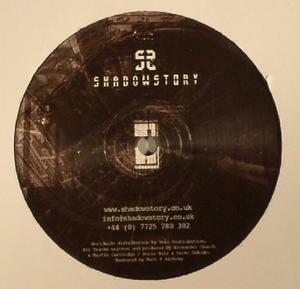 Dronelock and Ontal’s joint label venture Shadow Story is a base for the dark, industrial exploration of sound that all four corners of the British/Serbian double duo employ as their modus operandi. Having collaborated previously on the ‘4 Razors’ EP via Duality, the foursome unite again on ‘Continuum’, the second Shadow Story release. A 4-track vinyl outing that has already garnered DJ support from Surgeon (he played ‘Soil’ on his latest Rinse FM show https://soundcloud.com/dynamic-tension/surgeon-rinse-fm-broadcast-10-9-14), it comes bolstered by remixes from UK techno veteran Paul Mac and recent R&S signing Lakker, plus two digital-only bonus tracks. Title track ‘Continuum’ taps into the bleak, abstracted techno aesthetic that has come to define much of Dronelock and Ontal’s recent output, with ominous atmospherics and a hollow percussive pulse driving the track. Paul Mac’s interpretation offers an equally real threat, rewiring its icy core into a restless, reinforced electro assault. ‘Soil’ plays to its title, growing from a dormant, darkened state into soaring melodic peaks and vital drum palpitations. Dublin duo Lakker adds a weighty dose of percussive drama to the remix, whilst staying true to the track’s melodic integrity.